I'm locking my doors tonight in case the people from Nabsico try to take their revenge. Why, Snack-Girl, do you need to mess with an American icon? 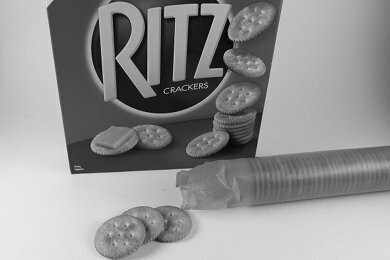 Ritz crackers are as American as apple pie, the Simpsons, and Chevrolet (are they still in business?). I remember my parents buying boxes of them. Their lovely red box with the blue and yellow - and the crackers - yum! At a certain point, my parents stopped buying them and started serving "Stoned Wheat" crackers. The name made me laugh and Ritz seemed to just disappear from the house. What is wrong with Ritz? High Fructose Corn Syrup is one of the ingredients. Why do you need sugar in a cracker? It seems totally unnecessary and just adds hidden calories to the food. There is 5% of your daily allowance of saturated fat in each serving. Again, added fat in a cracker makes no sense. A cracker should be just flour, water, and salt. And saturated fat! Didn't they get the memo? Zero fiber per serving - One of the benefits of eating bread or crackers is fiber. Don't look for any in a Ritz cracker. This cracker will melt into pure sugar once it hits your digestive juices. Have you ever noticed that as you chew a Ritz that it starts to taste really sweet? Your saliva is already getting to work on breaking down the carbohydrates into sugar). This is junk food. Nabisco uses white flour, corn syrup, and fat to destroy a perfectly healthy snack - a cracker. There are SO many better choices out there than Ritz. I will be featuring more healthy crackers as I find them (yes, I am looking at you, Kashi). Do you have a favorite cracker? What do you eat it with? Please share below. A Whole Food Snack of Salty Deliciousness and A Winner! At the moment I am loving Wheat Thins Fiber Selects Garden Vegetable. 15 Crackers have 4 g of fat and 5 g of fiber. New favorite snack is some of these with a wedge of Laughing Cow Light Cheese. I love Triscuits. Especially the flavored ones like fire roasted tomato and cracked pepper. I know they aren't the healthiest in the world but not as bad as Ritz for sure! I avoid all processed foods. Ritz crackers aren't any exception to that rule. In fact, I wouldn't endorse Kashi either. It's owned by Kellogg's and likes to hide the true content of sugar in its products by using different types. Then it doesn't have to list "sugar" as the first ingredient. Well, there goes my love for Ritz. I feed them to my children but not anymore! I am trying to become more of a label reader. I am finding that a lot of the foods I love have HFCS! a real disappointment. Thank you for this. Back to Nature's Multigrain Flax Flatbread Crackers are my new fave. I love them with Tomato Soup. I don't care for crackers, but my family does. They like All-Bran crakers but that too has some corn syrup, just not the HFCS, but I still need better cracker for them. It really is a a disgusting disgrace that the food industry knowingly makes products that are bad for their own customers' health. As a small business owner, I can't imagine producing and selling a dangerous product! I'm sad to learn this about Ritz, but really appreciate the info! In our household, we really enjoy: Stacy's whole wheat Pita chips, Dr. Kracker (good fiber and protein in the pumpkin seed cheddar) and Orbello's flat bread crackers with Rosemary (sometimes hard to find as its from Italy, but i see at World Market and Big Lots). I am in love with Mary's Gone Crackers! Gluten-free, dairy-free, certified organic, no sugar, no transfat or hydrogenated oils. Delicious and crunchy. I have actually compared a few brands and I chose Triscuit's. My favorite is the garden herb with some cheese. They are made with very few ingredients, and I feel that is important. If someone feels my choice is bad please let me know, I would appreciate it. Why do Ritz crackers have all those "evil" things you mention? To make them taste so good -- duh!! You make some very valid points, but I'm not going to give up something that tastes that good when virtually all of the suggested alternatives are about as flavorful as cardboard. I just won't scarf down as many of them as I used to before reading this! I just bought a box bec they were on sale. After eating only whole wheat crackers for years, these taste just like cookies. When I need a quick little sugar fix, I grab a couple. My 3yo son won't eat them. He says, "they're not whole wheat and I don't like them." Way to go kiddo! I'm going to have my husband take them to work and put them on the lunch table. I like the low salt triscuits. There is just enough salt for me. The regular triscuits are too salty. I end up eating too many so my original intention of eating a more healthy snack kind of goes out the door! My favorite cracker is Triscuit with Rosemary & Olive Oil. @Stephanie, my kids devour the Whole Wheat Ritz, but they do list hfcs on the ingredients... just checked. I recently discovered your blog, and I love it. My poor husband is having all his illusions shattered regularly now. Anyway, about Ritz Crackers being "as American as apple pie". When I was a kid, my mom made "apple" pie from Ritz crackers. It tasted remarkably apple-like, but the filling was all Ritz crackers. She only did it once - we all felt cheated when she told us the truth - but I remember it vividly. And there's got to be something wrong with a cracker that you can use for pie filling, wouldn't you agree?